Cypher Environmental was in attendance at the 2014 International Oil Sands Tailings Conference (IOSTC), which took place December 7th – 10th, 2014 in Lake Louise, Alberta. This highly anticipated event brings together industry stakeholders and experts to address tailings technology and management in Alberta’s Oil Sands Industry. Cypher environmental was pleased to present on the potential use of UltraZyme Hydrocarbon Powder, which is being considered for its potential to assist the remediation process of oil sands tailings. This research effort supports Cypher’s mandate of promoting environmentally-friendly and highly-effective solutions to leading industries. This project is being completed in collaborations with Dr. Ania C. Ulrich PhD. Peng., Associate Professor at the University of Alberta, Civil and Environmental Engineering department. 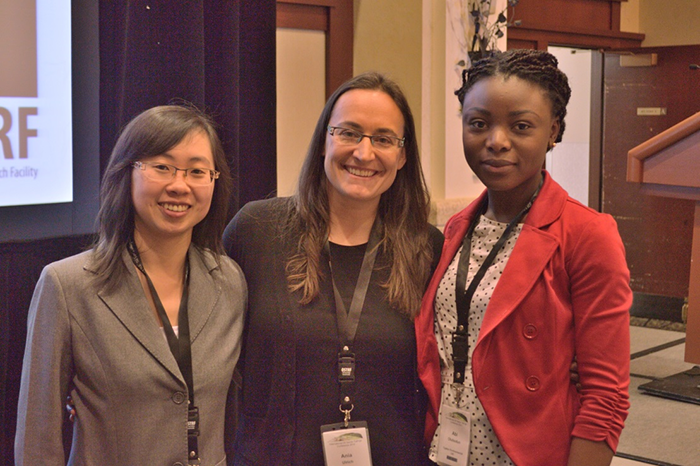 Pictured below from left to right are Emily Cao, graduate student at the University of Alberta, Dr. Ania C. Ulrich PhD. Peng., Associate Professor at the University of Alberta, and Abi Olubodun BSc., Remediation Specialist, Cypher Environmental. 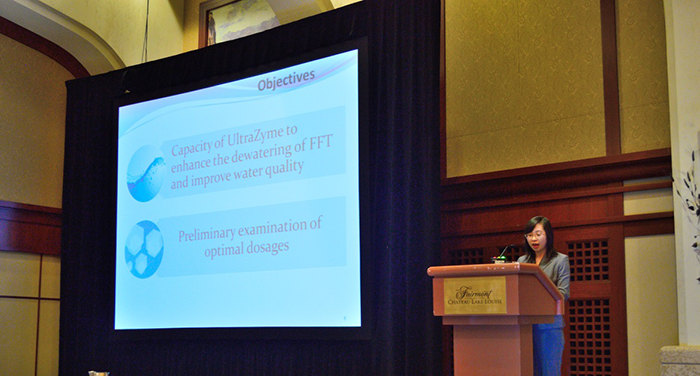 The presentation was conducted by Emily Cao (pictured below), graduate student at the University of Alberta, Civil and Environmental Engineering department. UltraZyme Hydrocarbon Powder is traditionally used to remediate oil spills on land and in water and therefore provides some significant potential for use to help with the process of treating oil sands tailings. Special thanks to the team at the University of Alberta for their tremendous efforts on this project. Click here for more information on UltraZyme.